Mount Qaf is an audiovisual performance installation and a spatial/temporal structure which expresses the aesthetic dimensions of Sufism and electronic music culture. 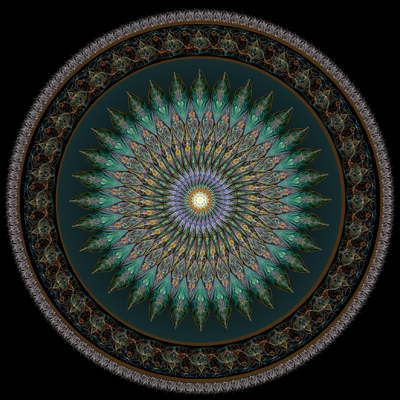 The experience combines generative digital art based on animating Persian patterns with eastern architectural motifs including Muqarnas, in syncopation with an ethnic electronic soundscape encountered through multi-channel acoustics. By re-imagining the traditional aesthetics of Sufism through the lens of electronic art and digital culture, the visual music journey of Mount Qaf sacralizes a nostalgia for the ancient past as well as reverence for an expectant technological future. As children of parents who immigrated from Iran, the artists are therefore participating in a space reminiscent of their spiritual heritage while remaining clothed in the fabric of their technological upbringing. In the culture of Persian Sufism, the sense of place which emerges from visual and acoustic aesthetics reflects the alam-i-mithal, or the transcendent Imaginal Realm. To this end, spiritual cultures have always fashioned tools and instruments intended to sacralize space and affect a sense of identity and belonging. Today, electronic and digital media constitute an emerging palette with which the notion of sacred space can be explored. In this way, this multimedia performance installation invites viewers to experience a novel cultural space and consider the mystery surrounding the transcendent sense of home.